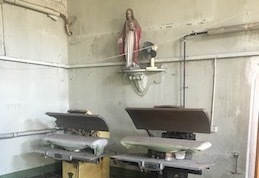 Creating people-focused approaches to institutions of shame: contemporary archaeology and the Magdalene Laundries of Ireland. This paper will present some of the results and discussion points from an ongoing collaboration between academics, archaeologists, museum curators and activists in their engagement with the material remains of a former Magdalene Laundry in Dublin, Ireland. In Ireland, Magdalene laundries were institutions run by religious orders and tacitly maintained by the Irish state. They contained thousands of girls and women, many against their will, as unpaid workers within industrial laundry complexes for periods of weeks through to decades. The last functional Magdalene Laundry in Ireland closed in 1996. In 2013 the Irish government apologized to the survivors of these institutions but there have been ongoing issues with accessing information from the religious orders and effectively administrating the redress scheme since that time. Taking an archaeological viewpoint, this paper will discuss the importance of material remains in working through the social justice implications of the recent past in Ireland. In particular, it will discuss the role of materials in facilitating long-term, public memory of the experiences of institutionalized women in Ireland. Furthermore, I will argue that there is an opportunity to push developer’s legal responsibilities relating to archaeological remains to ensure they include the narratives of survivors and consider what happens to the materials when transitioning these sites. Through discussing the various roles of material culture, this paper will reveal how materials are ambiguous and multi-faceted. They can be recorded, acquired, interpreted, presented in heritage institutions and used to inspire oral responses by survivors. Ultimately, I will argue the everyday world of the laundries - and the wide range of material culture that survives from these sites - can help us retrieve the perspectives and experiences of the survivors that we can attempt to ensure they are not lost moving forward. Laura McAtackney is an Associate Professor in the Department of Archaeology & Heritage Studies at Aarhus University, Denmark and Docent in Contemporary Archaeology at Oulu University, Finland. An archaeologist by training, her current research uses contemporary and historical archaeological approaches, and its heritage implications, to explore areas as diverse as material barriers in post-conflict Northern Ireland, female experiences of political imprisonment during the Irish Civil War and race/social relations on early modern Montserrat in the Caribbean (the latter is as a member of the SLAM project based at Wayne State University and Brown University in the US).